“It came without ribbons. It came without tags. It came without packages, boxes or bags.” Dr Suess. Unfortunately Christmas these days comes with rather a lot of all these things. The good news is that most kinds of paper can be easily recycled, including brochures, leaflets, magazines, unwanted mail, newspapers and scrap paper from the office and home. 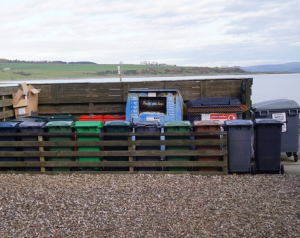 On Bute you can recycle paper and cardboard in a number of ways. For households with smaller volumes, you can use one of green bags. These are a convenient size for inside kitchen, hall or porch. These can be picked up from our ReStyle outlet, Deanhood Place, Rothesay or Recycling Centre, Colbeck Lane, Rothesay. Alternatively there are bring sites around the island where paper and cardboard can be taken. It is helpful to the recycling teams and considerate to your friends and neighbours, if you take a small amount of time to flat pack boxes. Breaking the box down ensures that there is enough space in the bins for everyone recycling, and collection teams can pick up all recycling in one pass – which saves carbon emissions from double runs. At this time of year, many people will be receiving parcels through the post. This means that the volume of cardboard is larger than normal. Your help in minimising the amount of air we transport would be appreciated. Click here to find out how your paper and cardboard gets recycled.